The birthday of Pedro Albizu Campos was Saturday, September 12, 1891. When he passed away, all of Latin America knew within minutes. Telegrams and cables poured in from all over the world. The Venezuelan parliament observed five minutes of silence in his memory. For three days before his burial on April 25, 1965, tens of thousands of people filed by his open casket, in the Ateneo Puertorriqueño. 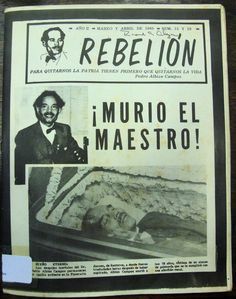 “El Maestro’ … Don Pedro Albizu Campos. May he be resting in peace! !